Heroes, Heroines, and History: Wigilia: The Polish Traditional Christmas Eve Gathering. Wigilia: The Polish Traditional Christmas Eve Gathering. The Polish Christmas Eve festival is one the most beloved traditions for Polish families. The highly anticipated Wigilia, or Christmas Eve Dinner ,is served during the festival. After days of preparation, the celebration starts Christmas Eve when the family anxiously awaits the advent of a very special star in the sky. This star is known as Gwiazdka, and it appears in the eastern sky. As soon as Gwiazdka appears, the feast to honor the birth of the Christ Child begins. similar to the altar bread in the Catholic Church communion service. 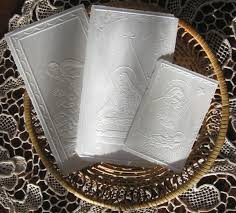 The wafers are imprinted with the figures of the Baby Jesus, the blessed Mary, and angels. Each person trades well wishes for good health, great wealth and joy in the New Year. This is a time of family bonding and love. Another Wigilia tradition is to set lighted candles in the windows. This signifies the hope that the Jesus might visit to share the Wigilia. It is believed he would appear in the form of a stranger. An extra place setting is always set at the table for this unexpected visitor. This belief stems from the ancient Polish adage, "A guest in the home is God in the home." 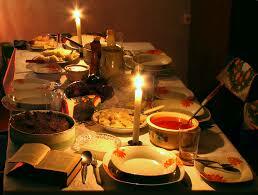 In preparation for the feast, an old Polish myth says there can never be an odd number of people at the dinner table. If there is an odd number, the legend says that some of the feasters will not live to see another Christmas. That’d be enough to make me want to sit at the kids table. The meal is the highlight of the night. There are twelve dishes served from the four corners of the earth: forest, sea, field, and orchard. Therefore, you will see such a rich variety of recipes based on fish from the sea, root vegetables, fruit from the orchard, dried mushrooms from the forest, and pierogi from flour taken from the field. 1. Clean and slice fresh mushrooms and soak dried wild mushrooms. Heat butter and olive oil till butter is melted. Add the onion, celery, carrot, garlic, leek, and barley stir until slightly softened, do not brown. 2. Raise the heat to medium high and add fresh mushrooms and season with salt and pepper. Cook 8 minutes until they are golden brown, stirring frequently. 3. Reduce heat and add thyme, bay leaf, and flour, stirring constantly and scraping the bottom of the pan for 5-8 minutes. 4. Add the stock and the rest of the ingredients, except the cream (or yogurt) and dill. 5. Bring to a boil, reduce the heat to medium, and simmer until slightly thickened for 30 minutes or until mushrooms and vegetables are tender. If too thick, add more chicken stock or water. 6. Remove the pot from heat and serve. Or, keep on low heat and add heavy cream (or sour cream / yogurt) to make a creamy krupnik soup. Taste and adjust seasoning, adding a few drops of lemon juice if desired. Cook for another 5-7 minutes. 7. Ladle into warm bowls and garnish with fresh dill or parsley. 1. Rinse thawed fish and soak (brine) for 30 minutes in a cold water mixture of 1/4 sugar and 2-3 tablespoons salt. You can skip this step, but it makes the fish tender, even if you accidently over-cook it. 2. Drain fish and pat dry. 3. Sprinkle fish with pepper, garlic powder, thyme, and salt on both sides. 4. Make three bowls, one with flour, 2nd with beaten eggs, and third with breadcrumbs. 5. Heat oil in large pan on high heat. Then dip fillets one at a time in each bowl in this order: flour, egg, and then breadcrumbs. Put fillets on pan and cook according to thickness of fish. 6. When fish is cooked, remove with a skimmer to a paper-lined basket, and serve with your favorite tartare sauce and a lemon wedge. 1. Thinly slice the leeks, using only the white part. Peel and core the apples, then slice thinly. 2. Toss all ingredients in a large serving bowl. Season to taste. 3. Let stand in a cool place for about an hour to allow flavors to blend together. 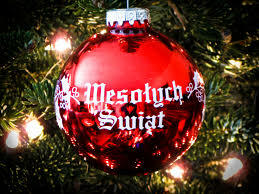 I appreciate this post about Wigila Polish Traditional Christmas--the symbolism of the different items related to the Biblical story of the birth of our Lord and Savior and God always being a guest in our homes. Thank you for sharing and the recipes--the soup sounds delicious. Thank you, Marilyn! I agree with your comment, I loved the connection to our Savior and the importance of family that's practiced during this traditional gathering. Merry Christmas and Happy New Year to you!